Nice Ambiente, service very good and friendly. Well selected choice of dishes on the menu. Good products and generous portions. Prettige ambiance, kwalitatief prima eten. We made a last minute reservation for lunch when they opened. It's a nice ambience, like a cave inside. It was cool and quiet. We shared the lucious pumpkin soup and a delicious salad! Excellent service! A nice restaurant. A bit overpriced but I guess it is normal for this part of Italy. The service was very good. Nice and charming staff. Everything was delicious but prepare for small portions. Everything was very good , from the aperitif proseco up till all of our dishes . 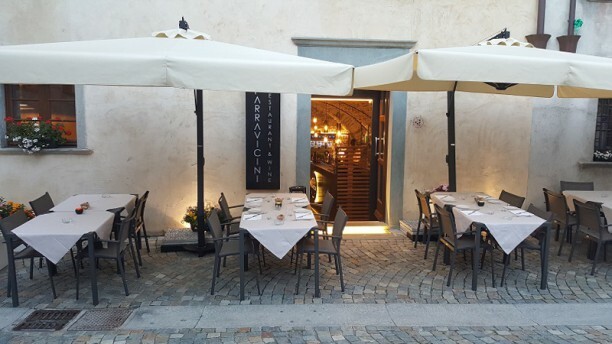 One of the best dining experience on our holiday in Lombardy . Couldn’t fault this fabulous dining experience! Grazie!! A really great spot for lunch. Fantastic food - homemade pasta. Lovely staff and good setting. Highly recommend! Not really Italian but rather European/ Swiss food menu accompanied by some pasta dishes. Food is ok, meat quality above average (we had grilled beef filet and veal cheeks). Salad and soup was way below average. Not a gourmet place but overall acceptable food and service. Nice atmosphere in tastefully designed old vault.